The Alarm Alert CM-4 continuously monitors up to Four (4) inputs and the line voltage via its wall mount transformer. The Alarm Alert can be called anytime to check the state of any input and the line voltage. When an input is not in its programmed normal state for longer than its programmed time delay or the line voltage is out for longer than five minutes, the Alarm Alert will call all programmed cell or E-mail addresses until contact is made. If contact has not been made after dialing all phone numbers, the Alarm Alert will wait twenty minutes and then begin calling again. This sequence is repeated until contact is made. 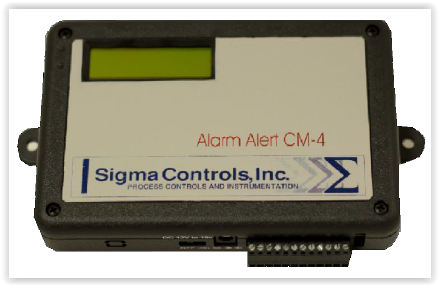 When the Alarm Alert calls CM-4 goes into an alarm condition it will send via text or E-mail unit ID message and the current state of the input that caused the alarm.